Ok, so rewind from the picture above - before we started ripping out countertops and sinks we removed and replaced our old range hood. 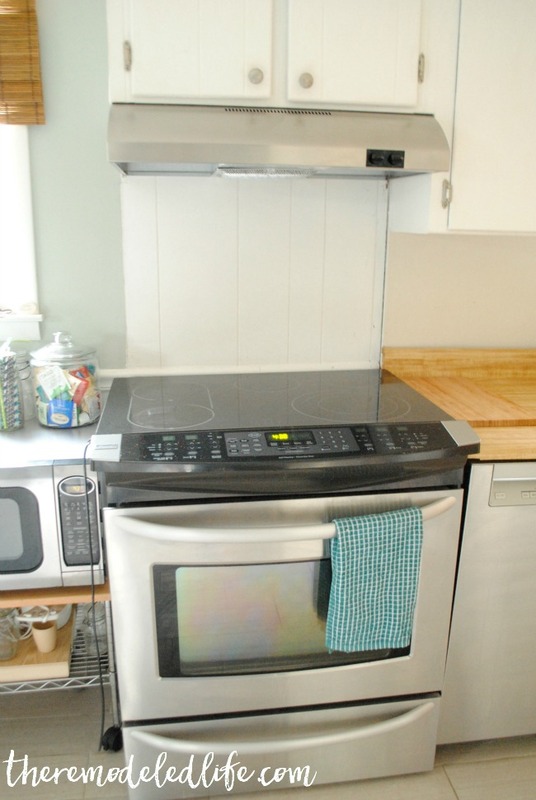 Within the last year we were able to upgrade our appliances to stainless. We were super thankful when some close friends offered their range/oven to us (they were upgrading to gas) and that kind of started a trickle effect on each appliance upgrade. Our dishwasher was on its last leg so we set out for a new one. Another friend of ours is an appliance manager at a big box store and was able to help us get a great deal on some discontinued floor models. We pretty much were able to score all 3 appliances for less than the cost of a new fridge (crazy). 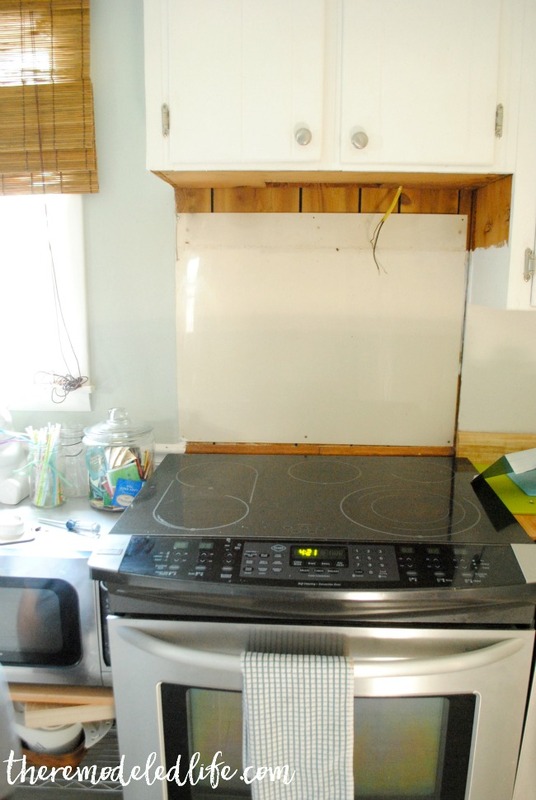 My advice for upgrading appliances on a budget would be to check places like craiglist, buy/sell/trade and such. Also, we learned that discontinued floor model appliances are very negotiable. You never know what prices you might be able to score if you are willing to negotiate and look at something not brand spanking new. So back to the range hood - this was actually a really easy upgrade. Removing it pretty much involved unscrewing it and disconnecting the wires. Also - please make sure and switch off the breaker when you are removing the hood since you will be disconnecting the old wiring and reconnecting the new wires. 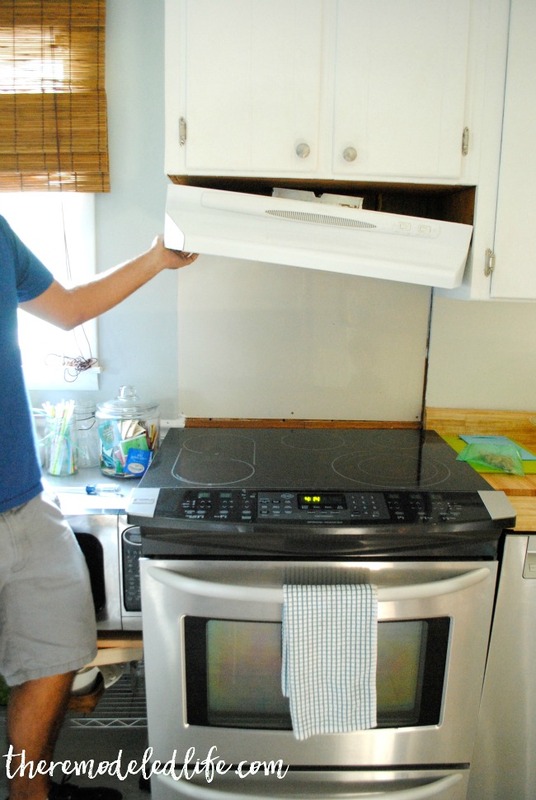 Before you buy your range hood take some measurements! Usually our house has weird pieced together oddly shaped things and I was really worried this would be the case- but thankfully it was really standard. But, I would measure just to make sure - standard has not always been the case for us (old house status). The ultimate goal for this space behind the oven is to install a tile backsplash (that will run the whole length of the counters) so we went ahead and removed the old plastic piece that I guess was serving some sort of purpose. Of course it was gross behind there. Since we are working towards tiling I just decided to grab some white paint we had and paint over the ugliness. After that we installed the new range hood - and tada! Done. Its nothing incredibly fancy but its nice and everything is now back to matching. Its a little addition but something I really think makes a big difference - something maybe you don't even realize until you do it. 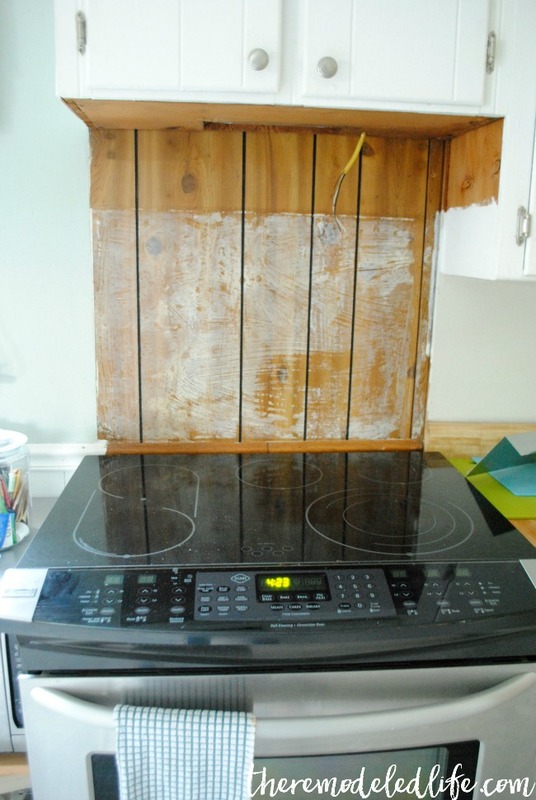 If you want to check out what we have done so far in the process of remodeling the kitchen- we have painted our knotty pine cabinets, replaced the cabinet hardware, installed a tile floor, replaced some lighting, painted the walls and painted a chalkboard door. 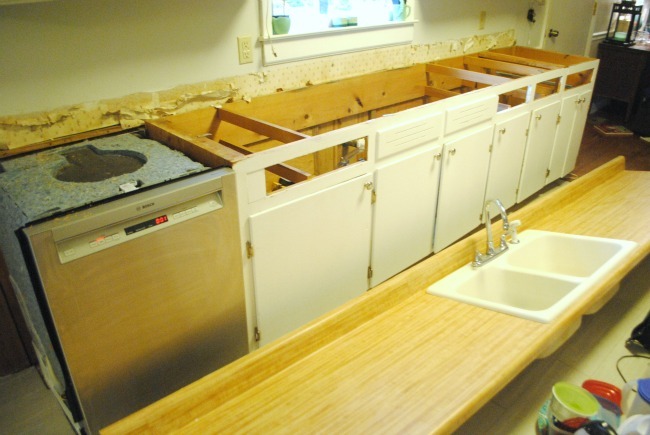 Lots more to share about with our little kitchen remodel! Stay tuned this week!